Where the deer and the antelope play. 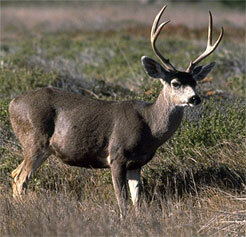 . .
Mule Deer. Photo by Dr. Llloyd Glenn Ingles, © 1999 California Academy of Sciences. 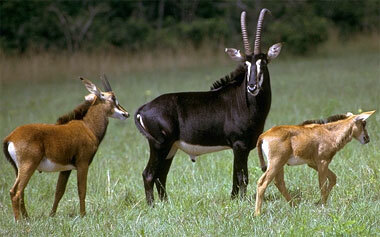 Sable Antelope. Photo by H. Vannoy Davis, © 2001 California Academy of Sciences. Artiodactyla, or cloven-hooved mammals, include such familiar animals as sheep, goats, camels, pigs, cows, deer, giraffes, and antelopes  most of the world's species of large land mammals are artiodactyls. Many living artiodactyls have evolved features that are adaptive for life on open grasslands. As beasts of burden and as sources of meat, hair, and leather, artiodactyls have assumed important roles in many cultures around the world. Visit DeerNet for information on the conservation of wild artiodactyls. Or check out The Ultimate Ungulate's pages on artiodactyls. Click on the buttons below to find out more about the Artiodactyla.